The level of uncertainty surrounding the future of Brazilian defender David Luiz at Stamford Bridge has drawn the attention of European giants Real Madrid and Juventus with both sides keen on bolstering their squad with the services of the out-of- favor defender. Despite playing a key role in the Blues title triumph last term, the Brazilian defender has found games hard to come by since he questioned Antonio Conte’s tactics in their 3-0 Champions League loss away to Roma in October. The former Paris Saint-Germain centre back has found himself ousted from the Italian starting line-up with Conte prefering to start Danish defender Andreas Christensen ahead of him. 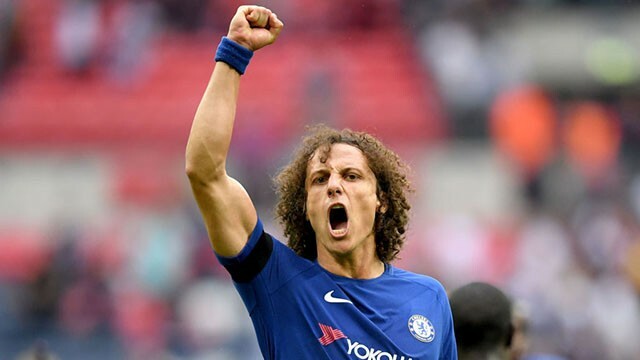 However, with the transfer window set to open next month, Juventus and Real Madrid are ready to put an end to David Luiz misery at the Bridge with both sides eyeing a winter move for the former Benfica defender. The Dailymail understand that Serie A giants Juventus are favorites to land the Brazilian defender as he his been viewed as a direct replacement for Leonardo Bonucci who left the Old Lady to join AC Milan in the summer. Although, reports also suggest that La Liga Champions Real Madrid are not far away in the purzuit of the 30-year- old defender with Zinedine Zidane earmarking him as a direct replacement for Portuguese defender Pepe who joined Besiktas in the summer. It is believed the out-of- favor defender could be available for a fee in the region of £23 million. Having played only once since the 3-0 defeat at the Stadio Olimpico in Rome, the experienced defender might be open to an exit away from the west-London club in a bid to get more playing time with the World Cup on the horizon. Luiz is often deployed as a centre back but can also play as a defensive midfielder and he is known for his passing, awareness, aerial prowess, tackling, interception and also a set-piece specialist. Types of Soccer Training Equipment Do the Pros Use? Indoor vs Outdoor Soccer: What Are the Real Differences?